One hundred years ago, to-day, the guns fell silent on the Western Front. It was a time for rejoicing. The War to End All Wars was over. And yet, amid the cheering crowds, there were those who were silent, mourning for those who would not return. For the story of Canadian physician and poet John McCrae and how he came to write this poem–perhaps the best-known of the Great War, see this podcast and transcription from Library and Archives, Canada. Mrs Daffodil has discussed the melancholy question of how to mourn the dead of the Great War here and here. This entry was posted in Death, Gentlemen, History 1910-1930, Mourning, News and Announcements, The Great War and tagged Armistice Day, Great War poetry, In Flanders Fields, John McCrae, poppies, Remembrance Day, The Great War on November 11, 2018 by chriswoodyard. Pauline Frederick’s fine emotional countenance relaxed into a smile on being requested to relate her most vivid Christmas experience; then it grew grave again, as though the request had conjured up an unpleasant memory. “This story relates to a young cousin of whom I was very fond, as we had practically been brought up together,” commenced Miss Frederick. “On the outbreak of war he joined the Canadian army. “On this particular night I was about to retire to bed, and my maid, who was drawing down the blinds, turned to me with a movement of surprise, and then cried out: ‘There’s a soldier coming up the garden path.’ I ran to the window and looked out. It was a bright moonlight night, and I had no difficulty in recognising the soldier as my cousin. Wondering that he had never informed me that he would have leave of absence, I went downstairs to open the door, followed by my maid. On opening the door and going out on the steps I found to my surprise that no one was in sight. With my maid we searched the garden, but everything was quiet and we went indoors again. Feeling a little uneasy, I questioned the maid as to the impression she had received of the soldier, and her replies convinced me that I could not have been suffering from hallucinations. “The next day I dropped a note to my cousin’s mother asking her if she had heard lately from her son. A reply came by return of post that she had that morning received a cheery letter from France, and that my cousin had asked to be remembered to me. Mrs Daffodil’s Aide-memoire: The narrative above comes from Miss Pauline Frederick, an American stage and cinema actress. It was part of an article about the unusual and supernatural experiences of actors and actresses. The Battle of the Somme, which began 1 July 1916, saw 60,000 British casualties just on the first day of the campaign. The Canadian troops were called on in September of 1916 to launch a series of new attacks against a particularly well-fortified trench. When the trench was bombed into submission, the Battle of the Somme ended. This entry was posted in Death, Gentlemen, Ghosts, History 1910-1930, Mourning, News and Announcements, Supernatural, The Great War and tagged Battle of the Somme, crisis apparition, ghost of a soldier, Pauline Frederick, recognized ghost, soldier's ghost on November 9, 2018 by chriswoodyard. On this Remembrance Day week-end we remember some of the alternative methods of mourning suggested during the Great War. The mourning armband with a star. 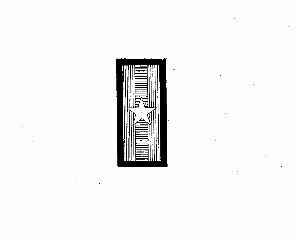 The patent application was filed in 1918, but it was not patented until 1920. Another arm-band scheme was suggested much later in the conflict and endorsed by the President of the United States. “No mourning costumes during war time, but rather the substitution of a mourning badge or an arm-band of black with a gray star,” was the recommendation of the General Federation of Women’s Clubs at a session at Hot Springs, Ark. Mrs. L. Brackett Bishop, of Chicago, suggested that the conventional period of mourning be abolished during the war. Mrs. Bishop has made an extensive study of colors and concludes that the wearing of black causes many mental disturbances. “Certain colors are avoided by women because their nature resents them,” she said. “But the general effect is happiness. If happiness is to be won in the world, color will do it. Another reason for this strong need of color is the fact that the earth revolves each twenty-four hours a day, and each day we are in the same plane as was the fighting of yesterday. We must be bright and cheery to overcome the cloudy days. Color will win the war for us, and it is going to be won by the colors we wear and by the brightness we can thus add to the world and to the people about us through the mental attitude expressed in our costumes.” A standard arm-band furnishes an excellent substitute for the wearing of black. It has all the objectionable features of black removed and still serves the purpose of indicating that a death has occurred. A return to a Victorian insignia of mourning was also suggested. 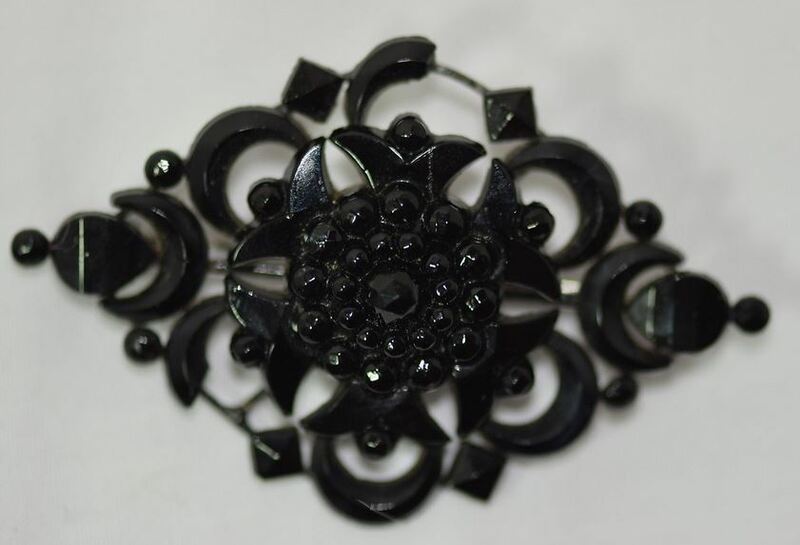 Old-Fashioned Jet Brooch Replaces Crepe. American Women Join in Move to Discard Mourning Garments. Now that almost all American women are joining it the movement to help win the war by banishing from the streets the depressing sight of crepe and deep mourning garments, the need is felt for some expressive symbol that shall be the privilege of those bereft by death, whether through the war or through other causes….every woman who feels it a sacrifice to give up her mourning apparel would appreciate some distinguishing symbol the wearing of which would satisfy her own heart. For more information on mourning in the Victorian era, with some notes on the Great War, see The Victorian Book of the Dead. 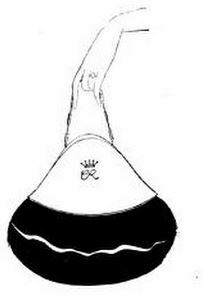 Mrs Daffodil’s previous Remembrance Day post on the Peerage in mourning is here. This entry was posted in Death, etiquette, History 1910-1930, Jewels and Jewellery, Lethal Clothing, Mourning, News and Announcements, Textiles, The Great War, Widows and tagged First World War mourning, jet brooch, jet jewellery, mourning armbands, mourning brooch, mourning crape, Mourning during the Great War, mourning jewellery, mourning reform, President Woodrow Wilson on November 12, 2017 by chriswoodyard. Good Luck Charms used by Soldiers in the Great War. The Wellcome Collection. 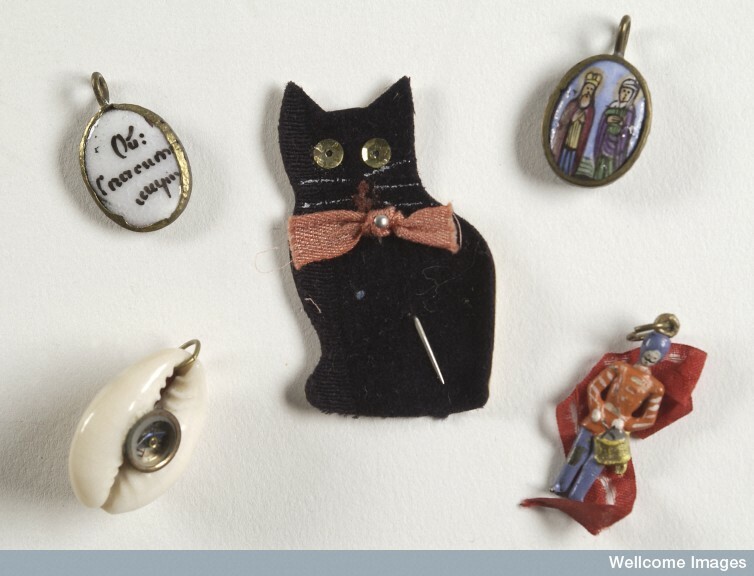 Many British Soldiers Carry Charms and Keep Mascots; Black Cats Favored. Behind British Lines in France. The feeling of fatalism is strong among soldiers. Many hold the opinion that “if the bullet is not made for you you won’t be hit.” One soldier boasts that he knows he will come through the war all right, because during his latest battle, a large piece of shrapnel on which he found his own initial fell at his feet. Mascots and luck-bringers of various sorts are numerous in all the armies today. 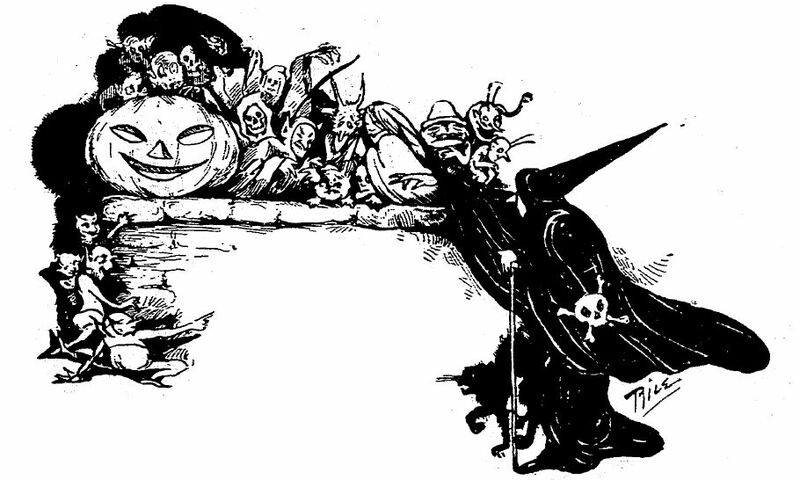 They are of great variety, although perhaps tiny rabbits and black cats made of “lucky” metal are encountered more frequently than anything else. Probably in most cases the lucky charm which a soldier carries is something sent him by his womenfolk in the homeland—a thimble, a ring, or a child’s trinket of some kind that has been passed down in the family as a luck-bringer. Among soldier’s superstitions, of which the British soldier has his full share, one of the most characteristic is connected with the number three. “The third time is never the same,” is a proverb among the Irish troops. “The third anything is fatal,” is a common expression among the English country battalions. Soldiers have been known to refuse to take their third leave, feeling certain that it will be their last. A soldier’s third wound is said to be the one which must be most carefully attended to. A development of this same superstition prohibits the lighting of three cigarettes with one match. Odd numbers, according to the British Tommy, are more likely to be unlucky than even ones, and thirteen is no worse than nine. Friday as an unlucky day has been dethroned, and there is no particular bad luck connected with any day of the week in Tommy’s estimation. Sunday, however, is preeminently a lucky day for battles. The lucky flower, by common consent, is white heather, and a piece properly tucked away inside the hatband is supposed to save the wearer from a fatal wound. Some regiments regard certain decorations and medals as unlucky, not to the wearer, but to the regiment in general. One very well-known battalion objects strongly every time one of its number is awarded the Military Cross. As regimental pets, black cats are regarded as the luckiest possession a detachment can have, and the arrival of a stray animal of this color at a gun-pit or dugout is an event of great importance. Everyone is bound to be lucky for some hours at least. To meet a black cat while marching up to the trenches puts every member of the company in the happiest humor. On the other hand, a black magpie flying across the line of march is a bad omen. To hear the cuckoo calling before breakfast is another bad omen. 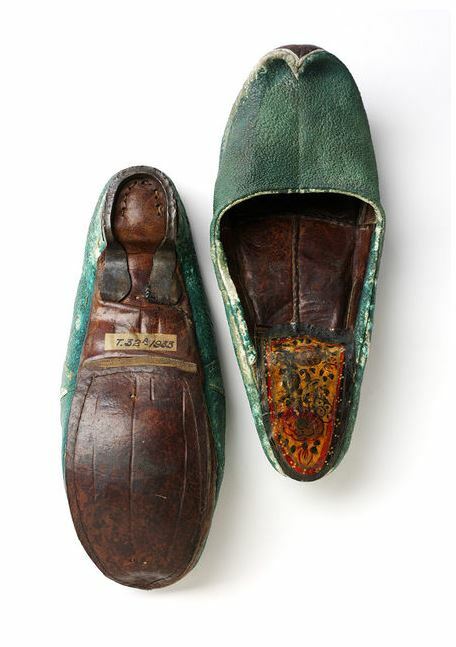 Mrs Daffodil’s Aide-memoire: The Imperial War Museums shared five “lucky objects” from the Great War. To-morrow is Armistice Day, the 99th anniversary of the end of the Great War, reminding us that many “Tommies,” despite their charms and mascots, were not lucky enough to return. This entry was posted in Animals, Death, Fads, Gentlemen, History 1910-1930, Jewels and Jewellery, News and Announcements, Supernatural, The Great War and tagged black cats, Great War, lucky charms, regimental mascots, soldiers' fatalism, soldiers' luck, soldiers' mascots, Tommy Atkins on November 10, 2017 by chriswoodyard. It is, Mrs Daffodil has been reliably informed, something called “Shark Week.” Mrs Daffodil does not, as a rule, celebrate ocean-going predators, but it is an excellent excuse to discuss the fashionable uses for shagreen. Four centuries ago shagreen—a handsome Chinese presentation of fish skin was the envy of all the young dandies about town, says an overseas fashion recorder. But shagreen was exclusive and expensive, cured and cut and shaped by hand, and it was only the dandy with a long purse who could afford to have this lovely decoration on his sword sheath or snuff-box. Once again Bond Street has revived shagreen. It has been displayed in the shop windows for some months, and just around the corner, off Old Bond Street, you will find the workers of the Chinese fish skin busy curing, “kneading,” and dyeing it to the perfection of its finished state. Just as was the case 400 years ago, it is still exclusive and costly. The process of manufacture is long and difficult. The skin does not lend itself to factory production, so that in shagreen articles you have one of the most beautiful of the hand-made productions. 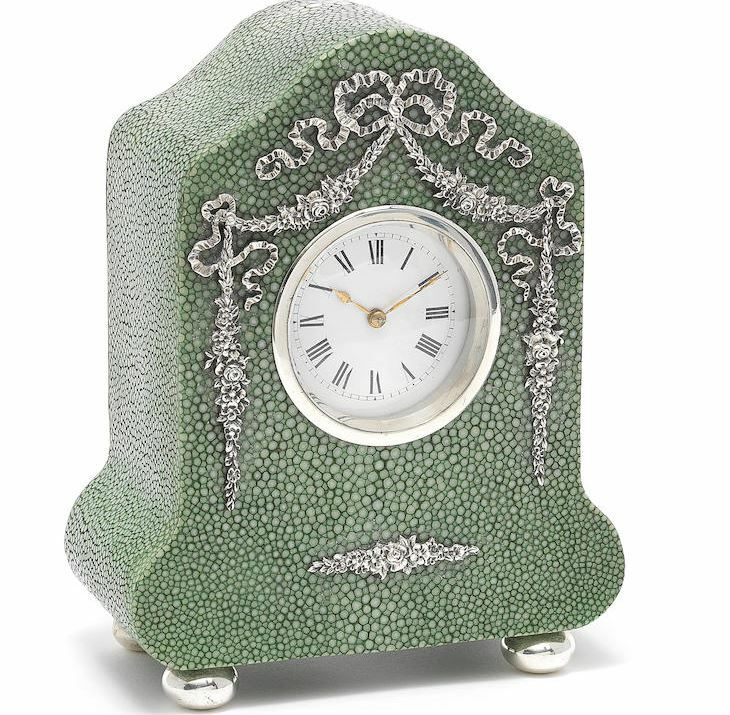 Shagreen experts tell me that the skin is “practically everlasting,” and, what is more delightful, age intensifies its beauty. It looks lovely bound with silver in brush-and comb sets. 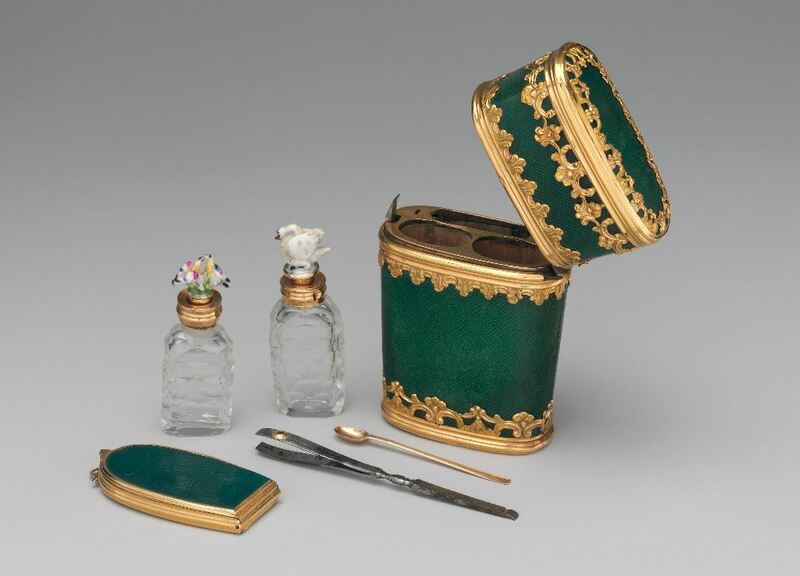 There are complete outfits for the secretaire, and endless small things like scent sprays, cigarette and match cases, and a few book-bindings are shown. The colours are exquisite—soft blue, grey, rose and especially green. It was the green that was used in the early 17th century—for the art of making shagreen take subtle dyes was not then known—and some fortunate people have pieces of green among their family heirlooms. In the little “factory ” 1 was shown shagreen as it arrives from the Orient. Actually it is (he skin of a small rare shark, and the raw material is as stiff and hard as a board. The placoid scales of the shark give it a very rough surface. It looks as if tiny pebbles have been embedded in the skin. They feel like stone. In the old days the skin of horses and wild asses was treated to imitate shagreen and part of the process was to embed a certain seed in the skin while it was soft, and so artificially manufacture the knitter 1 surface. As a rule the real skin arrives in a creamy tint and often in a colour that requires no dye. Many hours of labour have to be spent filing down the hard scales and kneading the buckram like texture to the softness of kid When ready for mounting the hard nodules have been transformed to a pearl-like pattern and even after dyeing this creamy colour remains where the scales were, and on this particular shark every pore seems to be a scale. No two skins are alike. Frequently two skins put into a bath of green dye will take the colour in two totally different shades. This not only annoys the worker but adds to the price of the finished article. Shagreen is used effectively to line the bathroom walls in the Queen’s dolls’ house, where the ceiling is of snail shell and the bath of rose rock crystal. Mrs Daffodil’s Aide-memoire: When we speak of “shagreen” and sharkskin, these, of course, refer to the actual skin of a shark rather than the louche shiny suiting fabric favoured by cads. 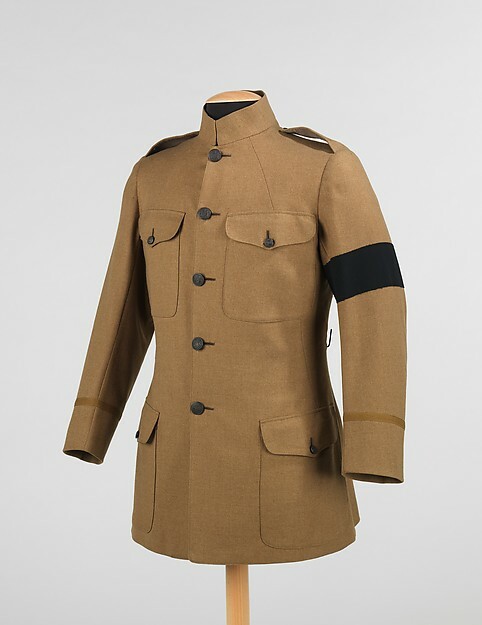 While sharkskin has long been in use as a luxe leather, it was not until the Great War’s leather shortages that its potential was once again explored. Demand for Military Purposes Leaves Little for Civilian Uses. America’s entrance into the war has created a demand for fancy leathers. For example, more leather has been cut up for wrist watch straps this year than ever before and the demand is increasing. Officers’ vests are being made from chamois skins. Leather is required for binding army manuals and reports and there is a big demand for leather for covering field glasses, cameras, surgical instruments, cases, etc. Steel helmets must be lined with leather. Leather is also needed for automobile and airplane equipment. There is a great demand for leather for straps, revolver cases, harnesses and saddlery, not to mention money belts, pipe cases, trench cigarette cases and the like. It is said that the demand for pigskin for leggings and other military equipment has practically exhausted the supply of this leather and cowhide is now being used by manufacturers of these articles. Little walrus will be seen in bags and cases this year as the Newfoundland catch of this animal was the smallest in many seasons and, due to the war conditions, no Norwegian skins came to this country this year. It is said that the high price of those skins which were obtained in Newfoundland practically prohibits their use. Unless next year’s American catch is unusually large and some way is found for releasing Europe’s supply of these skins, genuine walrus leather will probably be conspicuously absent in bags in this country for the rest of the war. Dealers and manufactures ware now concerned with the question of what is to take the place of walrus. Alligator skin, once so popular, is out of the question. Alligator skin went out of fashion when its growing scarcity made its price prohibitive. In the years since his tanned hide furnished the most popular bags of the day, the alligator has not increased in numbers. The Florida supply is practically exhausted. It has been suggested, though, that the hunting of these reptiles in Mexico and South America might be profitably developed. Finding a Use for Sharks. Sharkskin is the newest and most likely addition to bag leathers. Like that of the walrus, the skin of the shark is about an inch thick when it is removed from the fish. It is soft and spongy before it is tanned, but becomes a tough, fibrous leather when cured. A special process of tanning has been developed for shrinking fine, scaly, file-like surface of sharkskin until it assumes a grain similar to walrus. This process makes the skin practical for traveling bags. Hides of Sea Fish Used in Lieu of Cow Leather. Ft. Myers, Fla., April 4. Sister in devilfish dancing pumps. Dad in sharkskin shoes. Mother in stingaree slippers. These things will soon come to pass. A plant at Sanibel, Fla., is making them now. These fish, heretofore useless to man, are being caught and brought to the plant. Their skins are tanned. The tanning process was invented by Ehreinrich, president and promoter of the Ocean Leather Company. Ehreinrich has become wealthy by selling the European and South American rights to his process. The steaming jungles and the rolling ocean alike are being ravished for materials for feminine footwear. Many a debutant today selects shoes of snake skin in which to scale the social scarps. In supply this new and crying need, many a python has wrapped its last. It’s Used Now to Trim Motor Coats, As Well as for Smart Accessories. In addition to its uses in fashion, shagreen was popular for furniture inlays, cases for scientific instruments and cutlery, and desk accessories such as stamp cases, calendar frames, and bell pushes. It is rather nubbly in texture and is usually dyed a soft, arsenical green colour. The parlourmaids will attest that the texture gives it a special propensity to collect dust. This entry was posted in Animals, Edwardian, Fads, Fashion, Fashion Accessories, News and Announcements, Textiles, The Great War, Victorian and tagged 1920s fashions, Edwardian accessories, shagreen, shark week, sharkskin fashions, sharkskin shoes on July 26, 2017 by chriswoodyard. Old-Clothes Man: Have you any second-hand clothes? Algernon: No; never wear ‘em. The “Change Act” and the Economy. “Oh, no; a big trade is, of course, done with residents, but a larger part of the old clothes purchased are sent south or to Ireland….In former years and during the famines, business with the Emerald Isle was brisk. Many strange and incredible scenes are often enacted in old clothes dealers’ shops. There is one branch of the business which I don’t think is done so much here as in New York. This is called the change act. Chatham street and the Bowery contain many dealers who make a specialty of the change trade. “The change act consists of changing a good suit of clothes for an inferior one, and in receiving a sum of money as an equivalent for the difference in value of the two suits. When a man is broke he will do anything to get money, and if he has a good suit and knows the ropes, he soon disposes of his own good clothes for some of inferior quality. For instance, if a man enters my place with a $40 suit of clothes on his back, and I trade him one worth $10, I can well afford to give him $5 or $8 cash to boot. Some fashionable gentlemen who are seen in a dozen different suits each month own but one. 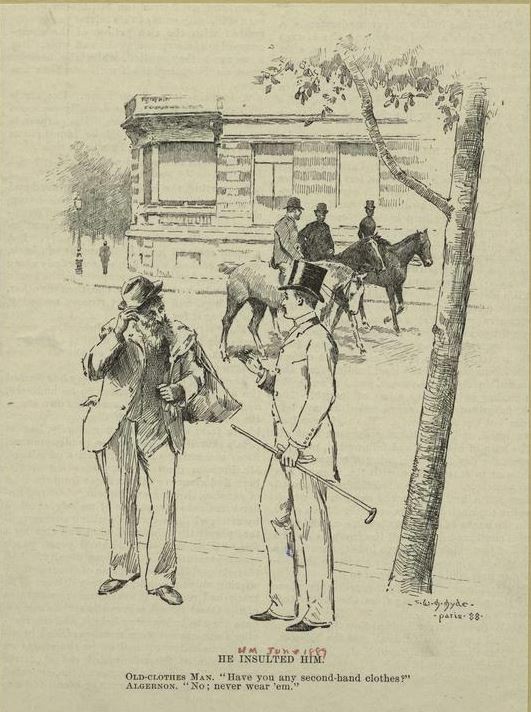 This entry was posted in Fashion, Gentlemen, Irregular Lives, News and Announcements, Professions, Textiles, The Great War, Victorian and tagged men's wardrobes, pawning clothing, second-hand clothing, Victorian men's fashions, Victorian second-hand clothing, well-dressed man, well-dressed Victorian on February 1, 2017 by chriswoodyard.